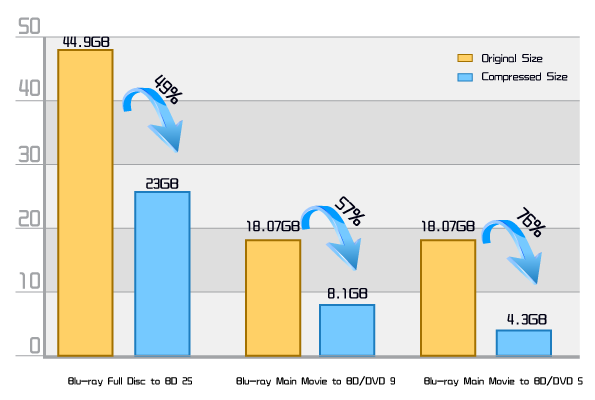 ﻿ Blu-ray Shrink, aka Blu-ray compression, DVDFab homebrew technology to shrink or compress Blu-ray (3D) discs to smaller size to fit on smaller blank media's. The increasing popularity of Blu-ray among movie enthusiasts gradually drives the entire Blu-ray ecosystem into its maturity. Blu-ray backup sector, one sub-branch of this huge growing ecosystem, is about to blossom. Speaking of backing up Blu-ray discs, there is one question which cannot be ignored. That's how to shrink a Blu-ray disc, especially those which are more than 25 gigabytes in size, to a smaller size to fit onto, say, a BD-25 blank, or even much smaller BD-9 and BD-5 blank. Currently, there's barely any software available on market can do so. That's exactly where and when DVDFab BD Shrink technology kicks in. BD Shrink, a new homebrew technology solely developed by DVDFab.cn. is born to answer the call of shrinking Blu-ray to a size smaller enough, so that it can fit onto a blank BD-25 media, even to DVD DL or DVD SL discs, instead of the expensive BD-50 blanks. Generally, it meets all people's different needs, in terms of Blu-ray compression. The output disc is still perfect in audiovisual quality, even when it is burnt to BD-9 or BD-5 disc, with some certain percentage of quality loss. You won't even notice with your bare eyes. In this case, BD Shrink is applied to shrink a BD-50 size Blu-ray disc onto a blank BD-25 disc, no matter the original Blu-ray disc is a regular 2D Blu-ray, or a 3D one. When it comes to 3D Blu-ray, the burnt BD-25 disc can be identical with the original disc as far as 3D format is concerned, or it can also copy and burn the original 3D Blu-ray as regular 2D Blu-ray, even can be converted into SBS 3D Blu-ray. This is absolutely the world first software can do so. In this situation, users can shrink a Blu-ray main movie title, usually no more than 25 gigabytes in size, onto a blank BD-9 or BD-5 disc. By saying BD-9 and BD-5 blank, it actually mean blank DVD dual layer, 8.5GB, and DVD single layer disc, 4.7GB in size. The reason we call it BD-9 and BD-5 is because the Blu-ray movie which is being burnt onto these blank media's is still in Blu-ray format. In simpler term, the burnt disc can play only on standalone Blu-ray player, not DVD player. BD Shrink is also applied in Blu-ray to DVD Converter, by which, users are offered options to convert the entire Blu-ray disc, check every box available at title, audio and subtitle selection areas, or the specific title, audio track and subtitle stream you want, into standard DVD-Video format and thus burn it onto blank DVD-9/5 disc. The distinction here is that the burnt disc is in DVD format, no longer Blu-ray movie and it can play on standalone DVD Player. Don't worry, the quality is very genuine, far better than the studio released DVD-Video disc.